Song, Y., Wang, C., Ren, G., Zhao, Y. and Linderholm, H.W. 2015. The relative contribution of climate and cultivar renewal to shaping rice yields in China since 1981. Theoretical and Applied Climatology 120: 1-9. Working with high-quality weather data, rice-growth data and agricultural-practice data, Song et al. (2015) conducted a study designed to determine what had been primarily responsible for the great increase in rice yield that had occurred over the past several decades in Northeast China's Heilongjiang Province, where the three types of data they analyzed had been acquired from the same set of locations. And this they did by separating the effects of climate change from those of periodic changes in crop varieties that are typically referred to as cultivar renewal. This work revealed, as the five researchers report, that over the analyzed period of 1981 to 2009, when rice yields increased by 2,095 kg/ha per decade, "the influence of climate on yields was estimated to be 805 kg/ha per decade, while the increasing trend due to rice variety renewal was estimated to be 1,290 kg/ha per decade," so that "38% of the yield increases can be related to climatic variation and the remaining 62% to changes in rice varieties." 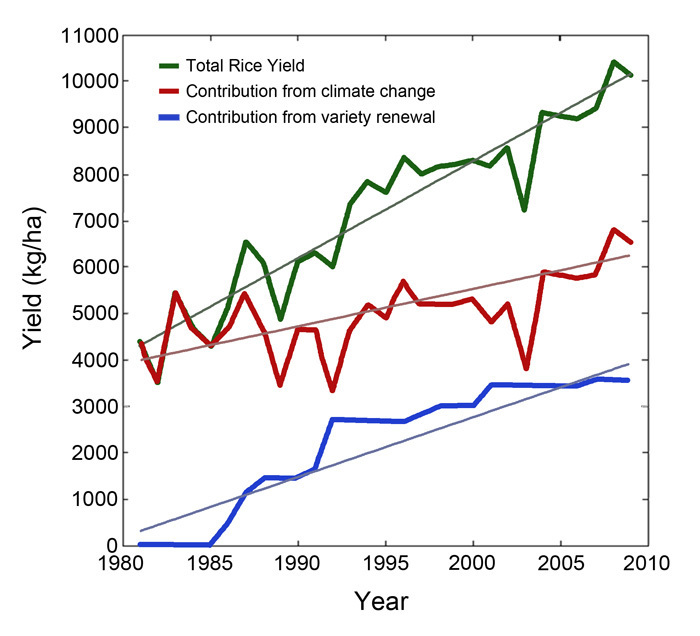 And they further indicate, in this regard, that "the effect of variety renewal on the rice yield increases was more pronounced before the 1990s, while afterward, the yield increases were mainly influenced by climatic variations" (see figure below). And so we see that both man and nature (as in climate change) were responsible for the historic increase in rice yield experienced in China's Heilongjiang Province between 1981 and 2009, but with mankind's efforts out-performing nature's contributions by a very significant margin. The change of observed rice yields (green line) at Wuchang station in China, and the contribution of climate change (red line) and rice variety renewal (blue line) on those yields, over the period 1981-2009. Adapted from Song et al. (2015).